WHAT: Exclusive sneak peek screening of the highly anticipated high-seas STARZ Original drama from Executive Producer Michael Bay, “Black Sails.” The first episode will be screened for fans only during Comic-Con 2013. Special guests to be announced. ABOUT: The pirate adventure “Black Sails” centers on the tales of Captain Flint (Toby Stephens) and his men and takes place twenty years prior to Robert Louis Stevenson’s classic “Treasure Island.” Flint, the most brilliant and most feared pirate captain of his day, takes on a fast-talking young addition to his crew who goes by the name John Silver (Luke Arnold). Threatened with extinction on all sides, they fight for the survival of New Providence Island, the most notorious criminal haven of its day – a debauched paradise teeming with pirates, prostitutes, thieves and fortune seekers, a place defined by both its enlightened ideals and its stunning brutality. 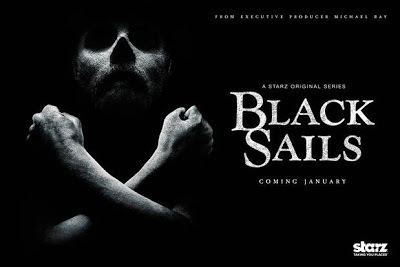 The series also stars Zach McGowan (“Shameless”) as rival Captain Charles Vane; Toby Schmitz as Rackham, Vane’s right hand; Hannah New as Eleanor Guthrie, a determined young woman who runs the smuggling operation on New Providence; Jessica Parker Kennedy as Max, a tortured young prostitute who sees the dark side of New Providence; Clara Paget as the beautiful but cold-blooded Anne Bonny and Tom Hopper (“Merlin”) as Billy Bones, boatswain of Flint’s ship. “Black Sails” is executive produced by Michael Bay (Transformers, Armageddon, Pearl Harbor) and his Platinum Dunes partners Brad Fuller and Andrew Form, producers on The Texas Chainsaw Massacre (2003) and Nightmare on Elm Street (2009). The series was created by showrunner and executive producer Jonathan Steinberg (creator “Jericho,” “Human Target”) and co-executive producer Robert Levine (“Touch”). “Black Sails” will debut with an eight-episode season in January 2014, exclusively on STARZ.